As some of you may know, I recently switched jobs and my new job requires me to go into an office. It’s a wonderful opportunity and I’m loving it – literally I love what I do. BUT, while I love being in an office environment, it was certainly easier to blog when I had a very flexible schedule. Now that I’m gone from home from 7am-7pm most days, I’ve found I have to be very strategic when it comes to my blogging. So with that in mind, I’m sharing a few tips that have helped me keep blogging even with an increased workload and objectively less time. Welcome to my Blogging While Busy tips – please share your own in the comments. Draft posts wherever and whenever you can. I draft posts while commuting, while waiting at the doctor’s office or in line. Having the wordpress app on my phone allows me to do that easily. While I very rarely launch a post from my phone, I can get the bulk of the text written so that when I’m at my computer all I have to do is edit and publish. Take advantage of small slots of time you have and make use of them. I can usually draft one complete post over the course of two mornings riding the bus to work – if traffic is bad, sometimes one morning! This makes a BIG difference in allowing me to continue blogging with limited time. We’re all busy – this is a great way to get it done! Get some support. My new Facebook Group (you can request to join here – please do!) recently did a blogging challenge last week: I challenged everyone to draft at least one post for the following week. It was really fun to do this together and with everyone’s support most of the group went above and beyond the challenge! Find folks who can help you with ideas to get posts drafted – blogging friends are a must! Themes and series’ are your friend. Each week, I know I’m posting a Friday Five post and I know I’m posting a training recap post. While I obviously can’t draft my training recaps in advance, I can go ahead and get the framework in a new post and fill it in over the week. I also do a blog stats and income post each month. I make sure to get these posts on my calendar monthly so I know where I have room for other posts. It really helps me to visually see it all (I use CoSchedule to help manage this – you can check out my review here) laid out like that! 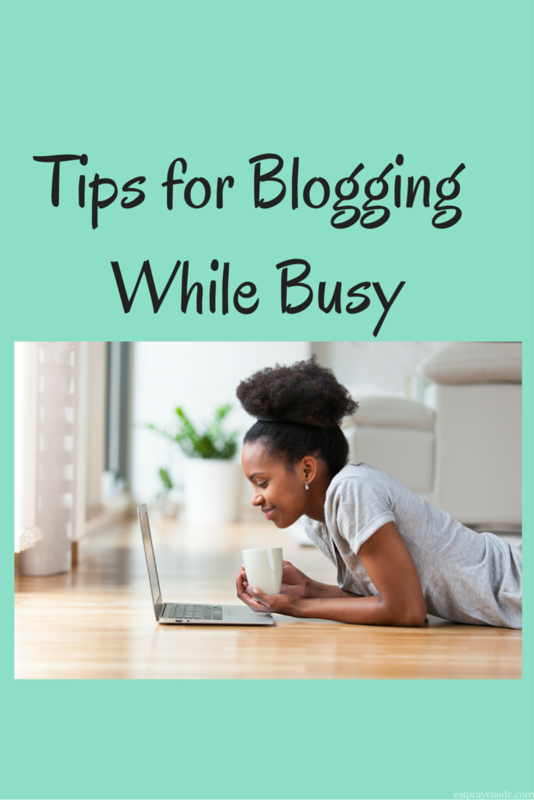 How do you handle blogging while busy? Thank you for the great tips! As much as we love our blog, life has gotten in the way. We have been discussing how we can revive our blog and be consistent in posting. These helpful hints are a great start. This post was written out of necessity – like you both, I’ve been crazy lately. These things have helped me and I hope they help you! I agree that blogging on the go is essential. I’m not in an office, however, I do work full time and am normally gone about 10 hours daily. It sounds like the job has been going well which is awesome to hear and congrats! I try to edit photos for the blog posts on Sunday night and upload them to my media page so that way I can just input them while I am drafting the posts. I definitely agree that drafting the posts on my commute to work is crucial! The metro always gives me tons of time! I struggle with taking the photos in natural or good lighting since I am usually home only when it is dark outside. I am hoping that daylight savings time will help me with that! Right now, I just end up taking photos on the weekends. I love your plan – that’s so smart to get photos ready! I don’t do a lot of recipe posts so I don’t have the same photography needs but that makes sense – natural light is always best! I am all about the themes. They sure do make it easier, right? One day at a time is all you can do! Thanks for this particular post. I was actually just talking to my husband about this and how other bloggers are able to get such good posts out so quickly, cause I feel that I struggle a lot. I figure that if I can get some good content out each week (even if it’s at least a post) it helps keep readers coming back. I am also curious how other bloggers handle getting posts out, responding to comments, and then try and stay on top of social media, and have a life at home, and workout. Blogging with a full time job definitely can be challenging! On days when I felt inspired, I used to draft multiple posts to have them available for when I was running short on time. Also having a co-blogger is amazing! Yes having a co-blogger must be so nice!! But yes drafting posts ahead of time is key! I enjoyed your FB blogging challenges both last week and this week. I didn’t mention on the FB page, but I’ve finished a draft for next week and the following week just like you challenged. 😉 I really feel this “group effort” is helping me stay better focused and challenged to work harder. Thanks! Debbie @ Deb Runs recently posted…Let The Shenanigans Begin! great tips! working full time can make blogging hard but I try and make it work. I am loving your blogger challenges!! I stick to themes on my blog. Right now, I do a Sunday Runday post about running (which will be ending soon once my work gets back into full swing). Tuesdays are for Adventure recaps – hikes I’ve done recently. Thursdays are for advice and “how to” posts. It’s been working really well for me and I am constantly inspired by new ideas while I’m out working. I use my notepad app on my iphone to keep ideas written down and draft posts if I have to. Since I use Sqaurespace, I have the mobile app the works INCREDIBLY well for not only drafting and editing, but also stylizing posts if I’ve already got the graphics made. When I have the time, I make my Canva graphics all at once when I get the post titles nailed down. Sometimes I’ve got them made weeks in advance and sometimes I’m scrambling! Congrats on your new job! It’s very rare people get to love what they do! I find blogging while “on the go” is pretty much needed. I find less and less time if I don’t fit it in between. I will quite often write posts, (preliminary) and save them to finish and add images at a later time. It makes it so easy to find things to post and never run out of ideas when you do this too. Also agree, themes and series are livesavers in the blogging world! I am out of the house 6:30am-8pm! I barely have time to eat and sleep! I like to draft posts on my phone! The wordpress app is good for that.